Ask what to expect from the office staff or pediatrician when you schedule the appointment for your baby or child. Also ask them to explain the purpose of the visit. Once you clearly understand the purpose of the appointment, explain it to your child in a manner that is appropriate for their age and level of understanding. Be honest with your child. While you don't want to cause unnecessary fear, you also don't want to lie to them. Children are a lot more resilient than we give them credit for. If they are forewarned of what to expect, even if it is an injection, they are better off. If you are not honest with them, they will develop issues of mistrust. While working on a Pediatric Unit, seeing screaming children being dragged by parents became a sad routine. I can't tell you how many times I heard parents say "we just told them they were going to the zoo! We didn't have the heart to tell them they were having surgery" or "if you misbehave the nurse is going to give you a shot!" It is close to impossible to regain the trust of any child in this situation, making the doctor and nurse's job that much harder when the child is not prepared for what to expect. Remember, no matter how hard it is for you, honesty is the best medicine you can give to your child! Start playing. If you can, buy a doctor's/nurse's kit with a stethoscope, and blood pressure cuff. You can even find a real stethoscope and medical "tools" (like a reflex hammer, flashlight or tongue depressor) for fairly reasonable prices at uniform supply stores. 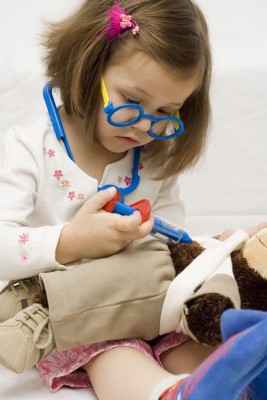 While playing "doctor" show your child what they might expect their doctor to do during their exam. You can look in their eyes, ears, and throat with a flashlight, listen to their heart and lungs with the stethoscope, tap on their stomach and knees with the reflex hammer (if you have one, if not, tap on their knees), weigh and measure them. When you are through examining them, switch roles! 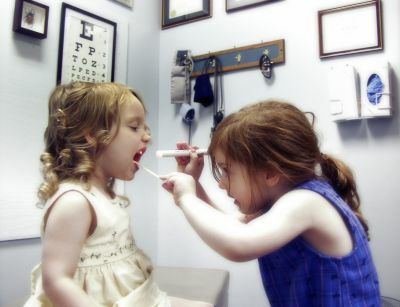 Let your child be the doctor and you be the patient. This can help your child work through any fears they may have and become more relaxed and familiar with the what to expect from the routine. If you have the opportunity, take your child with you when you go to see your doctor. This is another chance for your child to become more familiar with the routine. Be sure they understand that the doctor and nurse are there to help them and that they are not being punished. Be careful of the words you choose. The word "take", for example, paints a different picture to a child than it does to an adult. To a child "taking" something, means you will "remove" it all and they will not get it back. If you tell your child "they have to take your blood pressure" or "they have to take your blood", your child will think all their blood will be removed and they will die. If you have to use the word "take", you could demonstrate what to expect using a bucket or glass full of water. As you "take" two tablespoons of water out of the bucket or glass, you can show them that there is still quite a bit left in the bucket. .
A good word to use as a substitute for "take" is "check." Examples of this are: "I am going to check your temperature" or "the doctor is going to check your blood." Write down questions you want to ask the doctor and have your child do the same. Start getting them in the good habit of writing questions down ahead of time and taking notes during the visit! If you have a lot of questions for the doctor, inform the staff ahead of time that you may need some extra time with the doctor, so they know what to expect. Be aware of some of the common fears children have. Up to the age of 7 (and sometimes beyond) children have a fear of separation. They may be afraid you will leave them at the pediatrician's office. When discussing the appointment with them, be sure to let them know that you will be with them during their visit. Needless to say, children also have a fear of pain. Help them know what to expect for the appointment by checking with your doctor ahead of time to see if your child will need one or more vaccinations. There is a topical cream (EMLA) you can apply an hour ahead of time and cover with plastic wrap (like Saran® wrap). The cream will numb the area making the injection or blood draw less traumatic. If they are receiving more than one injection, ask the doctor to have two nurses at the same time give the two injections. While your child will still feel the pain, their body will perceive that they only received one injection instead of two. Distraction is by far the most effective (and least expensive!) way to help your child. Be sure to use an age-appropriate distraction. For younger children, playing with a puppet/toy, or making noises can be enough. If you have a portable DVD player, bring your child's favorite show and talk to them as they watch their show. Make sure they do not watch the nurse prepare the injection or see the needle before they receive the shot. Anticipation of the shot is often times worse than the shot itself! A child’s book written by Dr. Howard J. Bennett entitled "Lions Aren’t Afraid of Shots: A Story for Children about Visiting the Doctor" is an excellent resource for both you and your child. The book is divided into two sections. The first section is a beautifully illustrated story about a child's visit to the doctor and what to expect during that visit. The second section is written by psychologist Jane Annunziata. It addresses methods of dealing with anxieties of children as they relate to doctor visits. Even if this is a well baby visit, you will want to distract your baby with happy sounds while they are being measured and weighed. Your doctor will be checking their startle reflex. Your baby will be undressed to be weighed and may feel very cold while they are exposed. All of this can be traumatic if they do not have a parent to help distract them. Use the same "baby talk" you use to calm them at home or distracting them with a toy can help them relax. We all have fear of rejection and your child is no different! They may interpret the doctor's speed or "professionalism" as the doctor being upset or disliking them. Be sure your child (and you) feels comfortable with their doctor. If your doctor won the Nobel Peace Prize for Pediatric Medicine but hasn't won your child's heart or trust, you may need to consider finding another doctor! Your child's early experiences with their doctor sets the foundation for the rest of their life. You want the experience to be good!!!! Children also fear the unknown. It is important that you are always honest with your child so they will believe you when you explain what to expect from their visit. If you have not been honest with them, they may fear they are dying or have some serious illness instead of a simple check up! While you are role-playing, ask your child if they have any questions for the "doctor" or if there is anything they are afraid of. You can help them work through these fears and know what to expect before their appointment! If your child is scheduled to have a surgery, call the pediatric supervisor at the hospital and request a tour. Ask if you can take home any of the items your child may be expected to wear or see (hats or booties). You can incorporate this into their "play therapy." Allow your child to ask the staff questions about what to expect.